A Security Incident Occurs – is Your Business Prepared to Act? As a managed security services client, you receive support from a team of certified IT security professionals to help ensure incidents do not become issues. 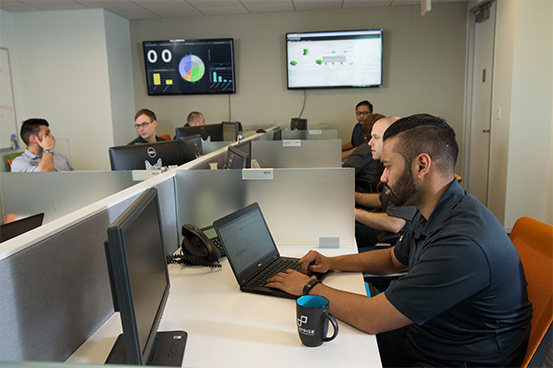 Our six step Security Operations Center (SOC) Analytics workflow process keeps us in front of even the most sophisticated attacks an organization can face. Our security vulnerability remediation services solve most problems before they become incidents. If needed, we escalate any found incidents according to each client’s customized Escalation Communication Plan and take the appropriate actions. These highly responsive and flexible security vulnerability remediation services are made to fit the needs of your specific organization, and the modular nature can be combined with other services or stand on their own. In today’s threat landscape, the chances of being hacked are high, regardless of business size. No matter how strong your security posture is, there is always a risk that your business may be attacked. Are you prepared with an IT remediation plan? When a breach occurs, following the 3 Rs can stop a threat in its tracks and help ensure your business stays operational through comprehensive security vulnerability remediation.